"Wantara Garden Suites" é um condomínio privado, escondido atrás de uma parede de adobe desde os tempos coloniais no centro histórico de Quito. A mansão, que remonta a 1900 e vários edifícios adjacentes dar casa para 8 apartamentos independentes. Seu Suite está localizado na vila Colonial restaurado, projetado para uma experiência de vida única. O estilo mediterrâneo apartamento independente é cuidadosamente decorados e equipados com todas as comodidades. Um fogão a lenha contemporânea proporciona conforto quente. O terraço privativo com vista para os belos jardins. Uma brisa do morro Panecillo fornece ar fresco da montanha e você se sentar fora, cercado por flores e desfrutar do clima ensolarado equatoriano. Uma ampla área comum com gazebo, espreguiçadeiras e churrasqueira convida a interagir com os outros hóspedes no nosso condomínio. Suíte Estrella é um dos apartamentos mais confortáveis ​​do nosso condomínio. A, 700 pés quadrados apartamento de dois níveis espaçoso está localizado no piso superior da casa colonial, com cozinha no térreo / sala de estar (dois sofás-cama também estão localizados aqui), sala de jantar e casa de banho; no andar de cima é o estúdio / quarto com uma cama queen size (160 x 190 cm) e excelentes vistas para o centro histórico de Quito e Mt. Pichincha. Estrella também está equipado com TV a cabo e DVD player, uma enorme seleção de filmes estão disponíveis. Acesso gratuito à internet Wi-Fi, serviço de quarto duas vezes por semana incluído e serviço de lavandaria. Superb across the board. Great hosts, beautiful place, wish they had places around the world i could stay at. 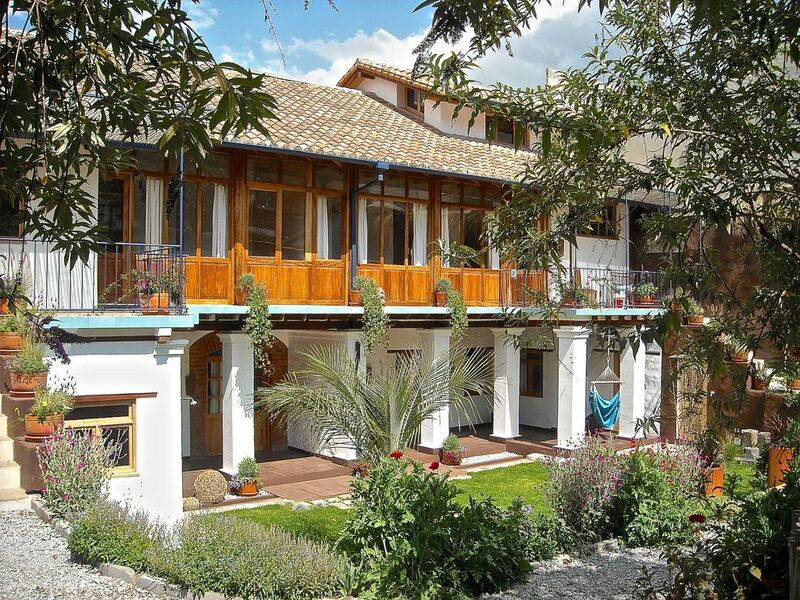 Ann and Wolfgang are excellent, considerate hosts, the accomodations are very comfortable (beautiful patios and gardens), and the location is ideal for exploring the historic center of Quito (short walk). Estrella is a beautiful oasis near the hustle and bustle of Quito. Great garden , nice digs, safe place (inside the gates), stylish. The owners are totally responsive and helpful. Would like to give it 5 stars, but there was a parking lot directly out our bedroom window with car alarms that go off until about 2 am every night. It's DIRECTLY out the window of the unit we stayed in. It isn't the owners' fault , and Quito is a loud-ish city where it is hard to get silence, but car alarms don't lend to good sleep . There was no ventilation in the bedroom, and since you can't open the window (it would be even louder), it got stuffy. I'm sure if we would have mentioned this to the owners , they would have gotten us a fan, but we didn't get around to it. The other thing we weren't thrilled with was that we were told the neighborhood isn't safe to walk around in at night. So you can feel a little trapped come dark. It actually seemed fine, with kids and families around, and we did walk back from La Ronda at night, so it's up to the traveler's comfort level. Again, this isn't the owner's fault, and it's always a good idea to caution people, but just be aware, it is not a bustling main street in the heart of Quito. (FYI on those bustling streets, which are awesome, there is still crime. I did have someone try to get into my backpack right in the heart of the city as I walked, but I had it so you could not get into it). I would not book away from Estrella, again, the garden is really a haven (birds! ), and it is peaceful, but you should also know the whole of it. Luxury hotels in the heart of the city are expensive now, and this is more affordable, so it does fill a nice niche. Quito is a great city, enjoy it! Absolutely stunning, in every way! This sweet property was an incredible find ... and the hosts are just lovely. We've used VRBO to rent apartments across the globe, and this was one of our absolute favorites. Could not have been any better. Highly recommend this property! Comfortable and well equipped one bedroom suite. Separate dining room overlooking the beautiful garden was a real treat to sit in. Great view up the hill to the Virgin of Quito statue. Wolfgang and Andi were very accommodating, easygoing, and friendly. We really enjoyed our stay and look forward to coming back in the future. We were pleased beyond our expectations! Suite Estrella was ready when we arrived at 3:30 AM. A clean suite with lovely amenities in old town walking distance to may sites. Centro colonial de Quito é um património mundial da UNESCO. Nosso condomínio está localizado na histórica Calle Loja que é mencionado na Cidade crônica que remonta ao século 16. Para a rua que conservar impressionantes, paredes de adobe de 400 anos, o edifício principal remonta a 1904 e foi usado como residência suburbana de uma família rica. A bela Plaza de Independencia, muitas igrejas, museus e calle 'La Ronda ", com todas as suas autênticas ofertas gastronómicas são apenas uma curta distância a pé. Quitos eco-bus 'trole' pára na esquina e / ou o serviço de táxi barato chegar à cidade moderna em 15-20 minutos.